"Morning is an important time of day, because how you spend your morning can often tell you what kind of day you are going to have." I completely agree with this statement. Morning is the most important part of our day and if started pleasantly, it can turn from a good morning to a gold morning! My mornings start with the sweet chirping of birds that lounge daily on my window sill and greet me with their excited chirping. Maybe they are planning their day then! Once I open my eyes, I first thank God for giving me a new day to live and a new chance to achieve my goals. My next stop is drinking a liter of water which is helpful in cleaning my body of all harmful toxins. I often add half a lemon to my water which is further helpful in detoxifying my body. While I drink my water, I try and catch the news headlines. Grabbing the newspaper from outside is the next thing done. I plan my day the night before so that I am not feeling rushed the next morning. My clothes to be worn the next day are kept aside in advance along with the papers and stuff I need to take to my office. This not only makes my mornings more peaceful and leisurely but also gives me time to engage in other things like exercising and having an unhurried breakfast with my family. Colgate 360 Charcoal Gold toothbrush leaves me with fresh breath in no time and turns my good mornings to #Colgate360GoldMornings. As you all must have experienced, until we brush our teeth a morning does not become good. So is the case with me. Until I brush my teeth, I don’t feel fresh and rejuvenated. 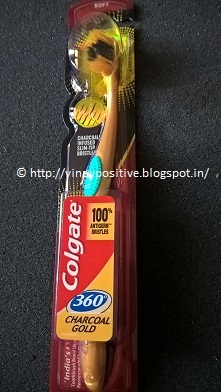 I have been using Colgate 360 Charcoal Gold toothbrush since quite some time and absolutely love it. It has soft bristles and a firm handle that enables it to go to the deepest corners of the mouth and effectively clean it. It leaves me with fresh breath in no time and turns my good mornings to #Colgate360GoldMornings. Exercising in the morning is a great way to strengthen our body and also feel energized. I exercise for half an hour each morning and while I sweat, I try to listen to some classical music which soothes my mind and prepares me to tackle the challenges that will come further in the day. After a shower and getting dressed, I pray and seek the blessings of God followed by breakfast with my family where we discuss our plans for the day, give our advice to any problems any one of us may be facing and thus, bond with each other. This is my mantra to turn my good mornings to gold mornings!